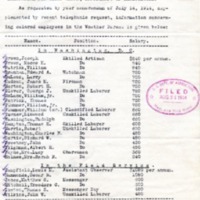 MEMORANDUM FOR CHIEF CLERK, DEPARTMENT OF AGRICULTURE. Brown, Joseph, Skilled Artisan, $840 per annum. Hampfield, Louis M., Assistant Observer, $1080 per annum. Chief Clerk - Executive Asst. Clark, C. C., “CC Clark to Chief Clerk (RM Reese),” 1914 August 3, A080314b, Race and Segregation Collection, Woodrow Wilson Presidential Library & Museum, Staunton, Virginia.